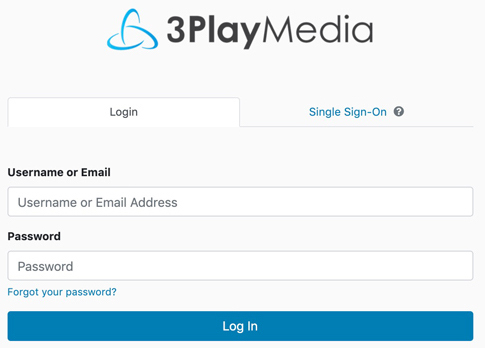 KVStudio includes a feature that allows you to import a 3Play Media transcript into your presentation template. For presentations where you want to have a transcript included, choose one of the KnowledgeVision standard templates that has an area for the transcript to be placed into. When the transcript is put into your presentation, viewers will be able to read along with the presentation. The template also provides a Transcript Search Bar allowing viewers to search for keywords in the transcript and navigate directly to the time in that presentation where that keyword appears. Below are the steps involved in creating the transcript and importing it into your presentation template. Click on Copy Video URL to copy the URL to your clipboard. Click Settings>File Formats then check the JSON box. 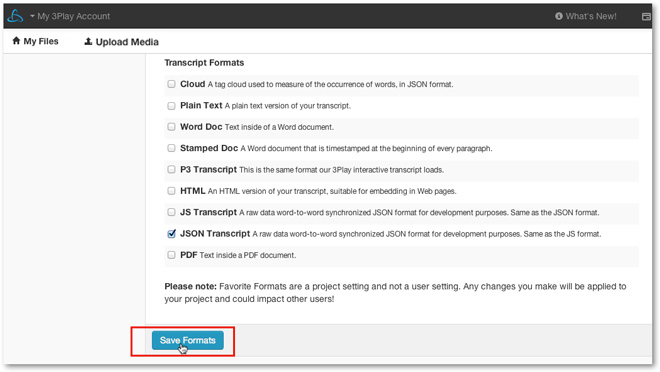 JSON is the file format needed to integrate with KnowledgeVision. See more information on configuring your Favorite Format settings. Once logged in navigate to the Upload Links page either by clicking Upload Media> Upload Links. Note: Click Transcription Settings on the right under Instructions to choose the settings for your files. Click here for more information on Transcription Settings. Copy the link to your video and paste it in the Step 1 field. You can upload multiple links in this field. Once all you links have been entered, click Upload. For this method to work links must point to downloadable files that are transferred over HTTP. These links will end with a media file extension like .mov, .mp3, or .flv. See more information about supported formats and codecs. YouTube links are also supported as long as they link directly to the video and are public within your YouTube account. If a YouTube link is copied from a web browser you the "s" may need to be removed from HTTPS to ensure the link can be be processed. 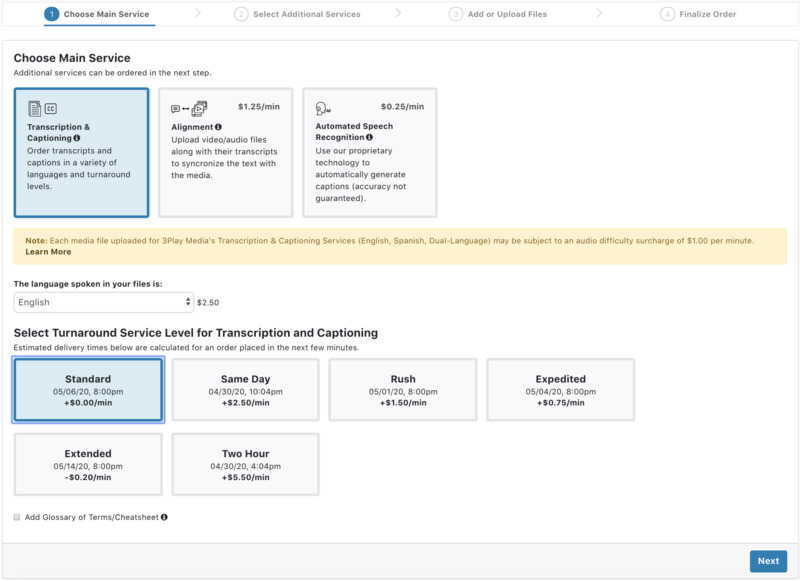 From the Service tab select either the English Transcription and Captioning default service or Alignment. 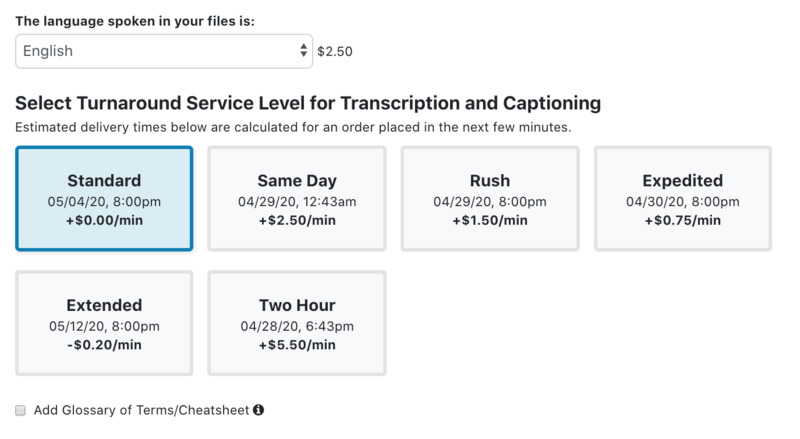 Choose the default service to have a transcript created from scratch using your media file (video or audio) as the reference and combines a technological approach with human clean up. Upon completion of the transcription process the file will be available for download in a variety of caption and transcript file formats. Select an existing folder to upload your content to or create a new folder for these media files. 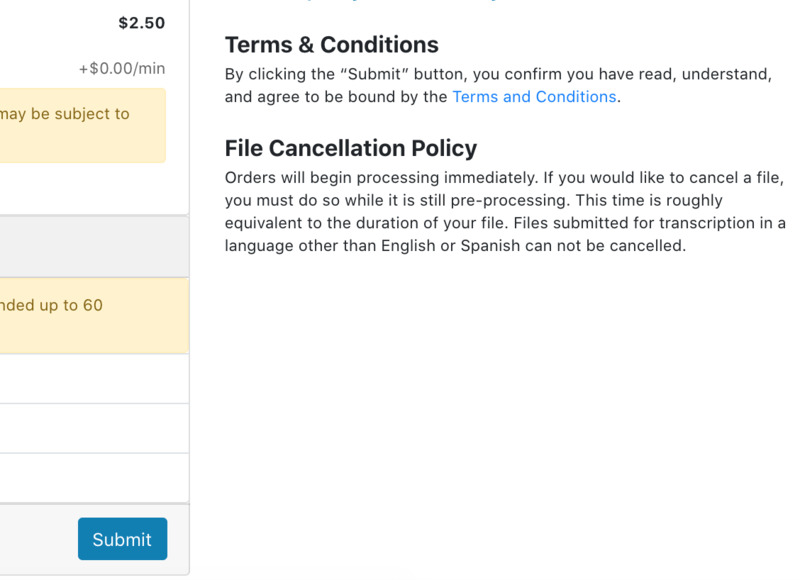 If you would like to change your folder, turnaround time, service type, or media files please go back and make changes BEFORE clicking Place Order. Please read the cancelation policy and check the box acknowledging that you have read this. When your file is ready for download, navigate to the My Files page of your account. Select the file that correlates to your KnowledgeVision Presentation. When it has been selected, the box to the left of the filename will become checked and the line will become highlighted in blue. See more information on tracking the progress of your file. Click on the Quick Download icon located above your list of files. From the pop-up menu click the download icon besides the JSON Transcript file format. Log back into your KVStudio account and navigate to the video associated with the JSON file you are adding. Click Step 2: Select Videos and click either Upload Video or Select another option. 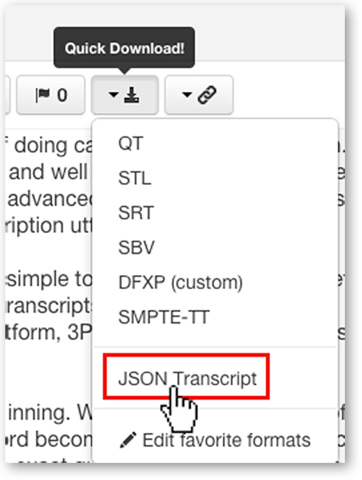 Click Upload Transcript and a search box will open for you to select the JSON file you downloaded in step 6. 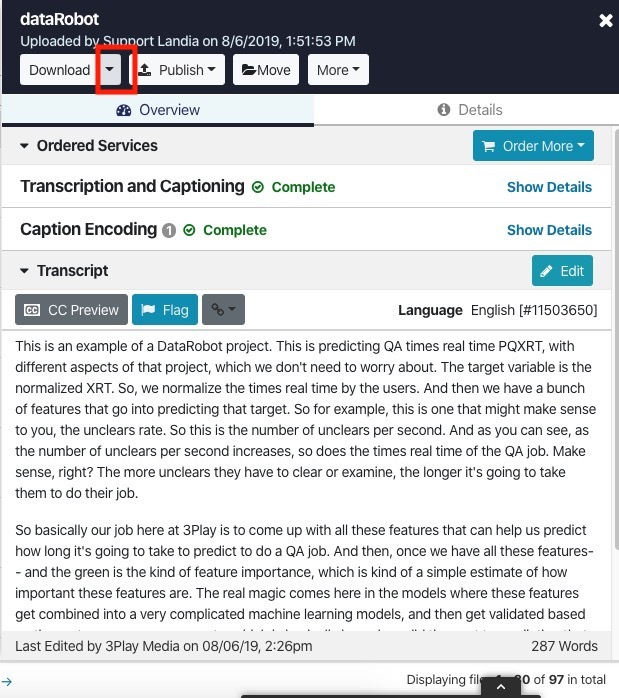 Once you publish the presentation, you can then preview it in your browser and review the transcript that displays. If you have additional edits, you can go back to your 3Play Media account and use the View/Edit function to make changes to the transcript. Next, download the latest iteration, re-upload the new JSON file, and re-publish the presentation with the latest changes.